The services that your business offers can be set up to be applied to appointments within the ‘Manage Services’ with them shown as below. Select ‘add service’ to create a new one. 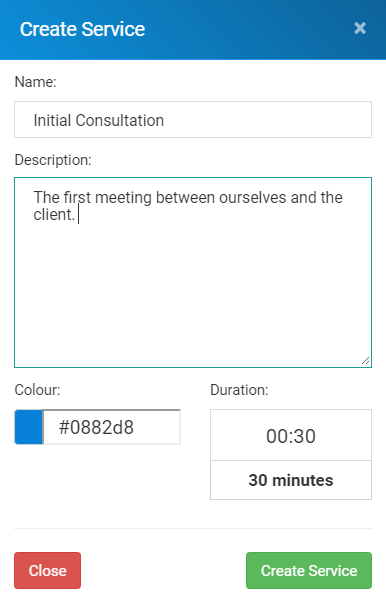 Within this window you can give the service a name, description and assign a specific colour and duration. When you are happy with the configuration, select ‘create service’ to add it to you system. It will then show up in the service list as below. You can remove a service from your system by simply clicking into the service from this view and select ‘Delete Service’ in the bottom right of the window.